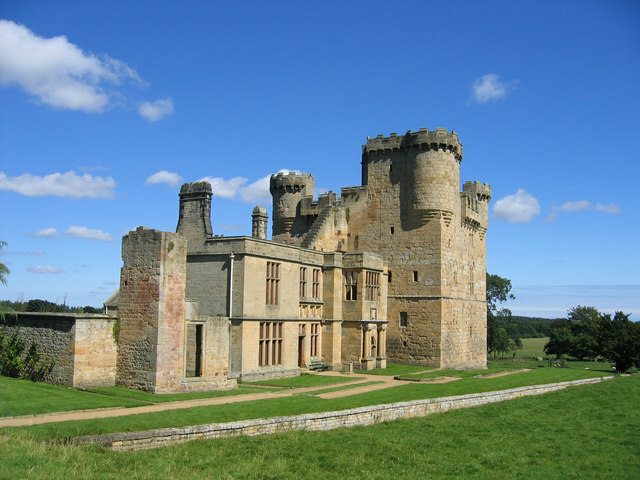 Notes: Belsay Castle is a 14th century medieval castle situated at Belsay, Northumberland, England. It is a Scheduled Ancient Monument and a Grade I listed building. The main structure, a substantial three-storey rectangular pele tower with rounded turrets and battlements was constructed about 1370, and was the home of the Middleton family. In 1614 Thomas Middleton built a new manor house attached to the tower. A west wing was added in 1711 but was later largely demolished in 1872 by Sir Arthur Middleton when the remainder of the house was considerably altered. The castle was abandoned as a residence by the family in the early 19th century when Sir Charles Monck built Belsay Hall close by. It is administered by English Heritage and is open the public. The interiors were largely removed and it was then used as a ready-made folly, as was fashionable among the aristocracy at the time, serving as setting for garden parties and other entertainments. "Belsay Castle". CastleUK.net. Retrieved 2007-12-21. "Belsay Castle". North of the Tyne. Archived from the original on 10 January 2008. Retrieved 2007-12-21.